Microsoft declared that Exchange 2010 SP1 had attained a sufficiently high standard of code and features to warrant release to manufacturing (RTM) on Monday, August 23. This decision was reached by the development team “war room” after the customers who participated in the Technology Adoption Program (TAP) provided their votes to say that SP1 was ready for the big time. This didn’t come as a huge surprise because the software has been very solid for the last few builds. Some late-breaking bugs did surface and caused minor impact on some features but certainly nothing to take the sheen off the overall value delivered in SP1. An interesting factoid is that the TAP sites had nearly half a million mailboxes deployed on SP1 before the final build was released, so there was no shortage of testing. I’ve written about the new features in Exchange 2010 SP1 for Windows IT Pro magazine. You can find the article at Windows IT Pro. The available space and editing and production requirements of a magazine will always restrict what you can write so not everything is covered (I guess that’s why I have been writing a book about SP1), so this post provides some late breaking news that isn’t in the article. Further details are available at Microsoft’s own blog post announcing SP1 at EHLO, posted today. This post also includes information about how to download the SP1 software. Or just go direct to http://www.microsoft.com/downloads/details.aspx?FamilyID=50b32685-4356-49cc-8b37-d9c9d4ea3f5b&displaylang=en. The release notes are available at http://technet.microsoft.com/en-us/library/ff728620(EXCHG.141).aspx. This release is interesting because it is available in 13 server languages (including support for bi-directional languages – Arabic and Hebrew- for the first time), 55 client languages (the ones that you can select to use with OWA), and 26 languages for Unified Messaging. As you can see from the screen shot, my Edge server still runs an early build of SP1 (one that I have clearly not gotten to upgrade) while server ExServer1 has been upgraded to SP1 RTM and server ExServer2 lags a few builds behind. For the record, these servers have now been upgraded. Those who are observant will notice that SP1 build numbers are lower than the RTM version (639.15). This is probably due to some internal Microsoft software build numbering rules that are impenetrable to normal human beings. A further inconsistency is seen in the fact that the version number reported by EMC (Help… About) is 218.13 rather than the proper minor build number. Such is life. What’s far more important is that the upgrade is very easy and quick. You do have to upgrade the Active Directory schema to accommodate a host of new features such as mailbox auditing. Afterwards the VersionNumber reported for the Microsoft Exchange Systems Object (MESO) object will be 13214 and the value of the rangeUpper attribute of Ms-Exchange-Schema-Version-Pt in the schema is 14726. The original matrix posted by the Exchange team on http://msexchangeteam.com/archive/2010/09/01/456094.aspx indicates that only four of these are required on Windows 2008 R2 servers. Microsoft subsequently updated this matrix to specify five patches for Windows 2008 R2 (the one that they added is 977020). All I can say is that various builds of the SP1 setup program complained about these patches and required me to install them, so I did. The one that is apparently not required for Windows 2008 R2 servers is 981002. Given the recommendation now available from the development group, I would start with the fixes on their list and only add others if Setup complains. Update: Windows 2008 R2 SP1 includes the necessary hot fixes so you don’t have to mess around with these patches before you install Exchange 2010 SP1. You’ll also have to update the Microsoft Office Filter pack on mailbox and hub transport servers to version 2.0. Remember to get the Adobe PDF IFilter and load it too if you want to include PDF documents in the content indexes. It’s best to install the Filter Pack on a server before you install Exchange as this will cause Exchange to register the Office filters for you as part of its installation. You can install the Filter Pack afterwards but in this case you’ll have to register the filters manually before Exchange can use them. See TechNet for more information. Setup normally runs very smoothly. A number of people, including myself, noticed a small hiccup when performing a B2B (build to build upgrade) on mailbox servers that are members of a Database Availability Group (DAG). It may be that this only happens when the servers are multi-role; in my case they also host the CAS and hub transport runs. In any case, the symptom is that Setup aborts because a process called “PowerShell” is locking some files (see screen shot). 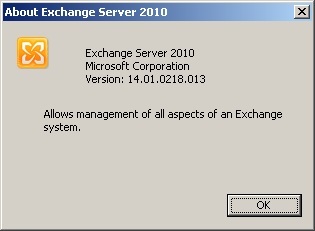 Note that if you are running Exchange 2010 mailbox servers in a DAG, you should upgrade all servers to SP1 and not have some servers run RTM and some SP1. The reason is simple: a DAG member running the RTM software can move its databases to an SP1 server but the reverse is not possible. Therefore, you do not want to arrive in a situation where you need to activate databases on a server and cannot because the server has not been upgraded to SP1. Update 1 September: Be aware of an issue that occurs when Microsoft TMG is used in conjunction with Forefront Protection for Exchange on an Exchange 2010 Edge server after SP1 is installed. It’s all to do with the fact that SP1 removes the Get-AntispamUpdates cmdlet, which then breaks the connections with the other products. 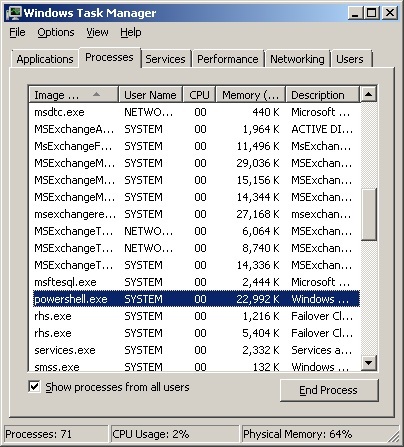 See http://blogs.technet.com/b/isablog/archive/2010/09/01/problems-when-installing-exchange-2010-service-pack-1-on-a-tmg-configured-for-mail-protection.aspx for more information. Update 2 – also 1 September: The Exchange engineering group has written a good blog on the issues that have been reported to them since SP1 was released. On the surface, it’s disappointing that such a list should be necessary given the huge effort that was put into testing SP1 over the last few months, but I think this reflects the diversity of environments that Exchange runs in and the massive challenge that any development group faces when they come to test new software. The old truth that an installed base is both a blessing and a hurdle to progress for any software product comes to mind. You can find the blog post at http://msexchangeteam.com/archive/2010/09/01/456094.aspx. Update September 2: Fellow Exchange MVP Johan Delimon points out that you need to apply the OCS integration after the SP1 installation finishes. According to Microsoft, RU3 for Exchange Server 2010 Service Pack 1 is currently scheduled for release in late February or early March 2011. Update: Microsoft has released an updated version of the Exchange 2010 SP1 help file that you’ll want to download as it includes a number of fixes for the product documentation. You can download the updated help file from here. Read more detail in my Microsoft Exchange Server 2010 Inside Out book, also available at Amazon.co.uk , other online stores, and at all good booksellers! This entry was posted in Exchange, Exchange 2010 and tagged Exchange 2010, Exchange 2010 SP1, Microsoft Exchange. Bookmark the permalink. 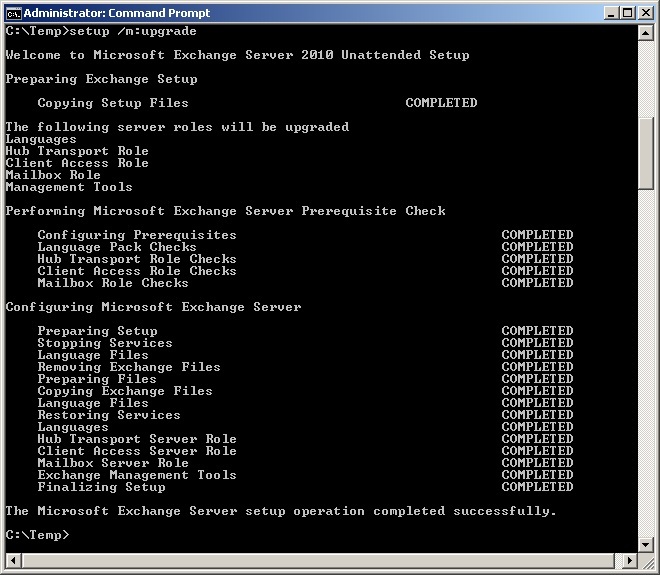 Excellent article that explains the real life deployment realities of deploying Exchange 2010 SP1. I found the necessary schema update and hotfix requirement to be poorly documented by Microsoft. Tony – how happy are you with your upcoming Exchange 2010 book that it sufficiently covers significant changes in SP1 RTM? Im looking forward to the release. @Rich, I am totally happy that my Exchange 2010 book is based on SP1 rather than RTM. I delayed the publication of the book to allow for a complete review of code for SP1 and have incorporated all the changes in the different chapters. For example, I cover topics such as block mode replication for DAGs, mailbox import and export with the new cmdlets, the introduction of the Remove-StoreMailbox cmdlet, the repair database cmdlets, the new scripts that SP1 has for database maintenance, the RBAC split permissions model, the new appearance of OWA, and many other issues that are very specific to SP1. So yes, I am 110% happy that I have covered SP1 in as much detail as I could given the constraints of page count etc. Thanks Tony – looking forward to the 2010 book release. I remember your first Exchange book back in 1996 (4.0 ?) . Keep up the great work.